The Senate Judiciary committee’s hearing opened this week on the nomination of Judge Brett Kavanaugh to be a Justice of the Supreme Court, and the Democrats are having a terrible time trying to find something wrong with him. One charge against Judge Kavanaugh is that he might be too favorable to executive power, by which the Democrats mean he might rule to uphold some high handed and unconstitutional action by President Trump. Judge Kavanaugh has a twelve year record on the DC Circuit, and it’s worth looking at how he addressed the question of executive authority. It’s true that Judge Kavanaugh has been very critical of unaccountable bureaucrats making far reaching decisions. A case came before him about the Nuclear Regulatory Commission’s decision to open the Yucca Mountain Nuclear Waste Repository. Congress gave the NRC that authority, but the President opposed its decision. But the President can’t remove his predecessor’s NRC appointees except for corruption or incompetence. Who was the President, who Judge Kavanaugh thought should have the power to decide? It wasn’t Trump or Bush, but Barack Obama. The Democrats need to find another argument for opposing Judge Kavanaugh’s confirmation. They’re not having much luck, and I hope their luck doesn’t improve. It’s embarrassing to watch the antics of geriatric children like Leahy as they try to derail the confirmation of a preeminently qualified juror such as Mr. Kavanaugh. The magnitude of arrogance of these democrat agitators is incalculable. 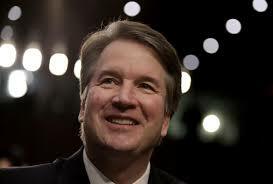 Evidently they did not heed the words of their beloved Pen & Phone president when he said “Elections have consequences.” I am looking forward to celebrating Mr. Kavanaugh’s confirmation, which is going to happen no matter how high the pitch of democrat squeals.